Salman Khan Reacts On Losing Veteran Actors Vinod Khanna And Shashi Kapoor! 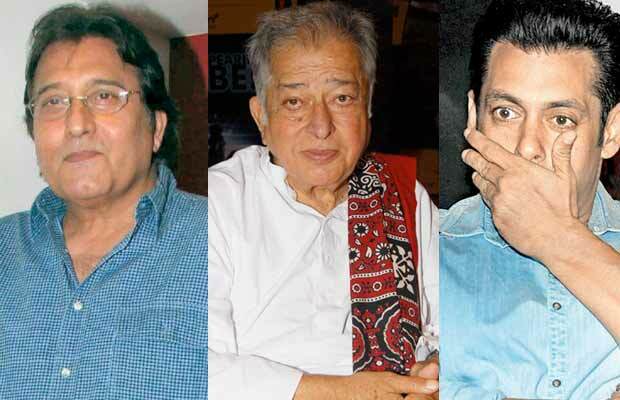 Home BOLLYWOOD Salman Khan Reacts On Losing Veteran Actors Vinod Khanna And Shashi Kapoor! Salman Khan says that he still can't believe that Vinod Khanna And Shashi Kapoor are no more! Salman Khan says that he still can’t believe that Vinod Khanna And Shashi Kapoor are no more! The Bollywood superstar Salman Khan is nowadays on Dabangg Tour with other celebs like Sonakshi Sinha, Prabhu Deva and Kriti Sanon. The star was is New Delhi where in a press conference, he talked about losing actors like Vinod Khanna And Shashi Kapoor. While we lost Vinod ji early this year, Shashi ji also passed away in the last week! The actor was very close to Vinod Khanna. Salman’s film Dabangg 3 is releasing in March in the next year. While in the earlier two parts of the film, Vinod ji played his father, Salman still can’t believe that the actor is not more. Talking about the professional front of Salman Khan, he is very soon going to be seen in the film Tiger Zinda Hai. Starring Katrina Kaif along with the actor, the film is all set to hit the theatres on December 22, this year. The film has been directed by Ali Abbas Zafar. And is the sequel to the 2012 release Ek Tha Tiger. Salman Khan is also a part of Race 3 starring Jacqueline Fernandez, Anil Kapoor, Boby Deol, Saqib Saleem, Daisy Shah and Pooja Hegde. The team of the film was recently spotted on the show Bigg Boss 11 to create a buzz in advance. Photos: Shashi Kapoor’s Ancestral Home City Mourns The Actor’s Loss! Previous articleBigg Boss 11: Arshi Khan Gets Unbelievable Special Power In This Week’s Nominations! Next articleFarhan Akhtar REACTS On The Amazing Response For Fukrey Returns!